Maternal instinct - the all-consuming, utterly selfless love that mothers lavish on their children - has long been assumed to be an innate, indeed defining element of a woman's nature. But is it? 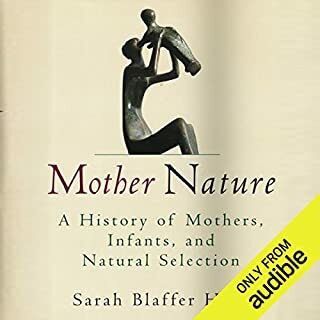 In this provocative, groundbreaking audiobook, renowned anthropologist (and mother) Sarah Blaffer Hrdy shares a radical new vision of motherhood and its crucial role in human evolution. Hrdy strips away stereotypes and gender-biased myths to demonstrate that traditional views of maternal behavior are essentially wishful thinking codified as objective observation. This is a book everyone should read. It will change your life and your perspective on human society. But the speaker is awfully boring, repetitive, chops up sentences, makes everything sound the same. It's a shame.